The Atlantic cod is an ecologically and economically important North Atlantic fish species and also an emerging aquaculture species. To study gene expression in Atlantic cod embryonic stem (ES) cells, our goal was to generate and analyze expressed sequence tags (ESTs) from an ES cell cDNA library of mRNA consisting of approximately 3,900 ESTs. We sequenced 3,935 EST clones using a directional cDNA library made from pooled ES cells harvested at the blastula stage. Quality filtering of these ESTs allowed identification of 2,719 high-quality sequences with an average length of 442 bp containing 368 contigs and 1,276 singletons (1,644 unique sequences). BLASTX searches produced 889 significant (E-value < 10-3) hits, of which 698 (42.5%) were annotated with Gene Ontology terms (E-value < 10-6). The number of unknown unique sequences was 946 (57.5%). All the high-quality EST sequences have been deposited in GenBank (GenBank: 2,719 sequences in UniGene library dbEST id: 22,021). Gene discovery and annotations are presented and discussed. This set of ESTs represents one of the first attempts to describe mRNA in ES cells from a marine cold-water fish species, and provides a basis for gene expression studies of Atlantic cod ES cells. Embryonic stem (ES) cells in culture and their development into different lineages is a unique model system that provide means to identify extracellular factors that influence embryonic cell differentiation and proliferation. ES cells are unique in their capacity to self-renew and to differentiate into multiple cell types. During differentiation, specific transcription factors activate the expression of genes that are required for each cell lineage. In addition, epigenetic regulation also appears to be a key mechanism for maintaining pluripotency and determining lineage specification . ES and embryoid bodies (partly differentiated cells) can be utilized to identify and characterize factors or genes including nutrients, growth factors and hormones that may affect cell proliferation, lineage differentiation and the expression of specific genes and proteins during developmental differentiation. In fish, mRNA in oocytes and early blastocyte embryos are thought to be exclusively of maternal origin; expression of embryonic genes occurs later, at the late-blastula or gastrula stage, the exact time for this transition varies between species [2–5]. The development of gene sequence knowledge (e.g. gene annotation) is of crucial importance within the field of functional genomics. Expressed sequence tags (EST) analysis is one of the most effective means for gene discoveries, gene expression profiling, and is also one of the most efficient ways for identification of differentially expressed genes. Sequencing of ESTs from cDNA libraries specially designed from ES cells and their application to fish exposed to dietary undesirables and environmental toxicants is of importance to determine how mal-nutrition and toxicants affect cell differentiation and proliferation. EST sequencing is also the first step on the road to proteomics, a core element in functional genomics, which includes methods for detecting protein expression and for detecting protein-protein interactions. Cell-based assays designed for the detection of nutritionally or chemically induced cellular stress are of particular interest for the analysis of differentially expressed genes at different developmental stages of fish. Short-term in vitro assays could also be applied to study the mechanistic basis of toxicity and could offer a rapid and economically inexpensive bioassay for fish. The Atlantic cod is a key ecological species in the North Atlantic, but is also an important commercial species. In recent years many North Atlantic stocks have plummeted as a result of overfishing, triggering efforts to establish a cod aquaculture industry. Sequencing of genes, transcription factors and receptors would be of high importance to better understand how nutrition's like vitamin A and fatty acids affect cell differentiation in early life stages of fishes, contributing to the nutritional aspect of a healthy and successful cod aquaculture. The aim of this study was therefore to generate and analyze a cDNA library for the study of gene expression in cultures of developing Atlantic cod ES cells, and to generate an EST resource for this increasingly important aquaculture species. Here we report sequencing of 3,935 EST clones, and generation of 2,719 high quality EST sequences from Atlantic cod ES cells. A brief examination of these EST sequences indicates that most of them are involved in binding (protein, DNA, RNA), catalytic (oxidoreductase), structural molecule (ribosomal) and transporter (transferase) activities. RNA harvested from ES cells was used for cDNA library construction. Newly fertilized eggs of Atlantic cod were obtained from Marin Harvest Cod, Øygarden. Eggs in the blastula stage (22–36 hour post fertilization (hpf)  were carefully crushed and the ES cells harvested. Cells were carefully washed and the cell pellet stored at -80°C until required. 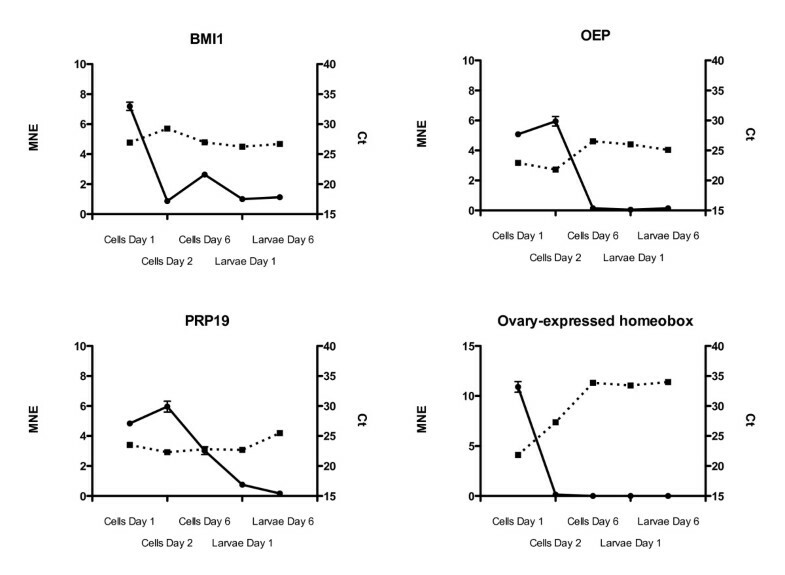 To assess changes in EST expression during differentiation by qRT-PCR cells were harvested from two separate batches of fertilized cod eggs stored at 6°C at; 22–24 hpf (day 1), 24–48 hpf (day 2) and 132–144 hpf (day 6). Newly hatched yolk-sac larvae at 1 day past hatching (dph) and larvae at 6 dph were also pooled, homogenized in Trizol and stored at -80°C for qRT-PCR analysis. Total RNA was extracted using phenol chloroform extraction (TRIZOL, Invitrogen, USA) and residual genomic DNA was removed by DNase treatment using DNA-free (Ambion, Austin TX, USA) according to the manufacturers' instructions. mRNA for construction of the cDNA library was isolated using Dynabeads mRNA Purification Kit (Dynal Biotech ASA, Oslo, Norway) according to the manufacturers' instructions. Quality and quantity of total RNA and mRNA was determined using NanoDrop ND-1000 (NanoDrop Technologies, Wilmington, DE). RNA integrity was assessed using the RNA 6000 Nano LabChip kit and Agilent 2100 Bioanalyzer (Agilent Technologies, Palo Alto, USA). A directional un-normalized library was constructed using pBluescript® II XR Library Construction Kit (Stratagene Cloning Systems, La Jolla, USA) and (dT) 18 primers. The finished cDNA was inserted into the vector in a sense orientation. Plasmid vectors were ligated into E-coli cells. A total of 3,935 EST clones were sequenced from their 3'-ends using T3 primer (T3: 5'-AATTAACCCTCACTAAAGGGA-3'). The inserts were sequenced using the MegaBACE 1000 platform using DYEmamic ET dye terminators (GE Healthcare). All ESTs were sequenced at a commercial facility (BGI LifeTech Co. Ltd., Beijing, China) after construction of the cDNA library. The chromatogram files obtained were processed using Phred for base calling and vector sequences from UniVec were removed using cross match . Clustering, assembly and quality filtering of resulting contigs and singletons was carried out using the assembly pipeline developed at the Computational Biology Unit of BCCS at the University of Bergen. This pipeline includes repeat masking using RBR and assembly using CAP3 [7, 8]. BLAST alignments of quality filtered contig and singleton sequences were then carried out against the GenBank non-redundant protein and nucleotide databases and dbEST (BLASTX and BLASTN, respectively, default parameters). High-quality sequences deposited in the GenBank after base calling and vector trimming as described above were imported into the Vector NTI Advance 10 and Blast2GO softwares and further analyzed. Assembly and clustering were done using Vector NTI with default settings to obtain contigs and singletons. Gene ontology (GO) annotations were assigned using Blast2GO . All 1,644 unique sequences were compared to the GenBank database as of February 2009 using BLASTX. The cut-off for sequence similarity was E-value < 10-3 for the BLAST searches and <10-6 for the annotation step. From these annotations, pie charts of sequence distribution were made using a 2nd level analysis and filter cut-off of 30 sequences based on biological process, molecular function, and cellular component. Four genes belonging to the GO "Embryonic development ending in birth or egg hatching" (GO:0009792) were selected for qRT-PCR analysis. These genes were BMI1 polycomb ring finger oncogene [GenBank:EX738556], One-eyed pinhead protein [GenBank:EX737753], Ovary-expressed homeobox protein [GenBank:EX736873] and PRP19 [GenBank: EX738721]. Two potential reference genes, GAPDH and β-actin, were analyzed for stability with the geNorm and NormFinder tools [10, 11]. The PCR primers used for amplification as well as gene function are given in Table 1. Real-time quantitative RT-PCR was performed according to Olsvik et al. . Briefly, a two-step real-time qRT-PCR protocol was used to quantify the mRNA levels of the genes in Atlantic cod cells and larvae. TaqMan Reverse Transcription Reagent containing Multiscribe Reverse Transcriptase (50 U/μl) (Applied Biosystems, Foster City, CA, USA) was used to make cDNA. Total RNA input was 500 ng in each reaction for all genes. No template controls (ntc) and RT-controls were run for quality assessment. Reverse transcription was performed at 48°C for 60 min by using oligo dT primers (2.5 μM) for all genes in 30 μl total volume. The final concentration of the other chemicals in each RT reaction was: MgCl2 (5.5 mM), dNTP (500 mM of each), 10× TaqMan RT buffer (1×), RNase inhibitor (0.4 U/μl) and Multiscribe reverse transcriptase (1.67 U/μl). 2.0 μl cDNA from each RT reaction for all genes was transferred to a new 96-well reaction plate and the real-time PCR run in 20 μl reactions on the LightCycler® 480 Real-Time PCR System (Roche Applied Sciences, Basel, Switzerland). Real-time PCR was performed using SYBR Green Master Mix (LightCycler 480 SYBR Green master mix (Roche Applied Sciences, Basel, Switzerland) and gene specific primers (500 nM). PCR was achieved with initial denaturation and enzyme activation for 5 min at 95°C, followed by 40 cycles of 10 s denaturation at 95°C, 20 s annealing at 60°C and 30 s elongation at 72°C. Mean normalized expression (MNE) of the four target genes was calculated according to the geNorm manual , in which the raw Ct values are transformed to quantities with PCR efficiency correction. β-actin was used as a reference gene in the final calculations since GAPDH was too unstable. PCR primers, amplicon sizes and function of genes selected for qRT-PCR analysis. The descriptions of gene function were obtained from the GeneCards database  of human homologs. A total of 3,935 ESTs were sequenced from the cDNA library made from Atlantic cod ES cells, summarized in Table 2. After quality filtering 2,719 high-quality EST clones were identified, with an average length of 442 bp. Thus, about 30% of the sequences were filtered out; a relatively large amount of the total number of clones sequenced. 8% of the 2,719 high-quality sequences were shorter than 300 bp. The quality of the cDNA library was good, with a titer of 106 cfu/ml and a net average insert size for all clones of 1.3 bp. Cluster analysis assembled the 2,719 high-quality ESTs into 368 contigs and 1,276 singletons (1,644 unique sequences). 42.5% (698) of the 1,644 unique sequences were annotated to known genes using BLASTX with an e-value cut-off of 10-3 and an annotation cut-off of 10-6 with the Blast2GO software. There were 946 unknown unique sequences (57.5%) in the cDNA library. All high-quality EST sequences were deposited in the GenBank at NCBI, searchable as "Gadus morhua stem cell library ZNS". Accession numbers are between EX736070 and EX743943 (2,719 ESTs out of a larger number of Atlantic cod EST sequences). The 2,719 sequences from this library have also been assembled in the UniGene database . 1,952 ESTs from this library were grouped into 1,001 UniGene entries (putative genes) (UniGene build #7, 22-Aug-2008). Analyzed using Blast2GO software with a BLASTX cut-off of 10-3 and a GO annotation cut-off of 10-6. 1Percentage of high-quality sequences. The 22 most abundant genes from the cDNA library are listed in Table 3. These contigs consisted of 11 or more ESTs. By comparing these contigs with sequences in other Atlantic cod libraries  it is evident that most of these genes are not uniquely expressed in ES cells. Most abundant was H3 histone, subunit 3B. There were also several other histone genes among the most abundant genes, i.e. histone H2A family member ZA, histone H2A family member X and H3 histone, subunit 3A, as well as genes involved in transcriptional regulation of chromatin assembly such as chromobox protein homolog 3, maintenance of chromatin architecture high-mobility group box 2 and THAP-domain containing 9. Histones are the core components of the nucleosome. The nucleosome is a histone octamer containing two molecules each of H2A, H2B, H3 and H4 assembled in one H3–H4 heterotetramer and two H2A-H2B heterodimers. Nucleosomes wrap and compact DNA into chromatin, limiting DNA accessibility to the cellular machineries that require DNA as a template. Histones play a central role in transcription regulation, DNA repair, DNA replication and chromosomal stability . Transcription regulation, epigenetic modifications and chromatin structures are the key modulators in controlling the pluripotency nature of ES cells . Thus, histone modifications appear to be of great importance for ES cells to maintain their pluripotency, explaining the high abundance of chromatin-related transcripts in the examined ES cell cDNA library. Also among the most abundant transcripts were genes encoding proteins involved in cellular respiration including COX1, COX2 and cytochrome b as well as a number of ribosomal genes. Using the UniGene approach, the FXYD domain containing ion transport regulator 9b ranked top as the most abundant transcript (see the link above). FXYD genes encode membrane-bound regulatory proteins associated with Na, K-ATPase and thus osmoregulation adaptation in teleost fishes . The most abundant ESTs detected from the 2719 high-quality clones in the cDNA library. Assembly and clustering were done with default settings in ContigExpress (a component of the Vector NTI Advance 10.3.0. software). The high-quality ESTs were compared to annotations through the Gene Ontology Consortium  using Blast2GO. Filtered with 30 sequences cut-off, the 696 known unique sequences with GO hits were used to create graphs based on percentages of 2nd level GO terms (Fig. 1). The five most common biological processes were translation, regulation of transcription, negative or positive regulation of cellular processes and intracellular transport (Fig. 1A). Comparing all 2719 sequences, including redundant ESTs, the most common biological processes also included nucleosome assembly and regulation of developmental processes. In the category of molecular function, the five most abundant transcripts were involved in protein, DNA and RNA binding as well as oxidoreductase and structural constituent of ribosome activities (Fig. 1B). Under the cellular component category, most transcripts were linked to the protein complex, as well as to membranes, ribosomes and the nucleosome (Fig. 1C). Although the most abundant GO terms are linked to rather common ontologies, the high ranking of GO terms like nucleosome assembly and regulation of developmental processes clearly demonstrate the uniqueness of the library. In order to further evaluate the uniqueness of the sequences from the ES cell library, the annotations of the 2,719 ESTs in this library were compared to two other cDNA libraries obtained from early developmental stages in Atlantic cod; G. morhua embryo library (UniGene library dbEST id: 23,116 containing 10,821 ESTs from embryos at the cleavage stage) and G. morhua larvae library (dbEST id: 23,099 containing 17,519 ESTs). Comparing the top-ranking ESTs from these three libraries using Digital Differential Display (DDD) and Fisher Exact Test, the UniGene tools developed to compare EST profiles in order to identify genes with significantly different expression levels, it is evident that chromatin-related transcripts involved in restriction of transcription are especially abundant in the examined ES cell library. Gene ontology (GO) graphs using percentages of 2 nd level GO terms. Overall, 696 high-quality sequences were annotated using Blast2GO software and included in the graphs. Each of the three categories is presented, including biological process (A), molecular function (B) and cellular component (C). The number of GOs in each class is shown, restricted to GO classes with 30 or more entities. Four randomly picked genes belonging to the GO "Embryonic development ending in birth or egg hatching" (GO:0009792) involved in maintenance of pluripotency and cell proliferation were analyzed in cells at day 1, 2 and 6 as well as in larvae at day 1 (yolk sack) and 6 in order to validate the cDNA library (Fig. 2). In many vertebrates, including teleost fish, early development of the embryo is directed by maternal transcripts and characterized by limited zygotic gene activity . Genes annotated to the selected GO should therefore show clear time-dependent alterations in transcriptional levels as the embryo goes through the blastula stage and early differentiation. Based on previous qRT-PCR studies of transcripts in ES cells in mammalian systems, GAPDH and β-actin were chosen as reference genes . Analyzed with geNorm and NormFinder, β-actin was relatively stably expressed and was used for data normalization (NormFinder variability score 0.13 ± 0.1). Raw Ct values are included in the figures for comparison of expression at time points (dotted lines, Fig. 2). One of the examined genes, ovary-expressed homeobox protein, which resembles the mammalian Nanog gene, exhibits a transcription pattern typical for ES cell markers with a characteristic post-blastula transcriptional drop. In addition, the detection of another ES cell specific gene, an ortholog of the mammalian Pou5f1, validated the authenticity of the blastula-stage cDNA library. Two transcripts, annotated to this ES cell specific marker, were found in the cDNA library. These proteins are essential for self-renewal and repression of genes initiating differentiation thus maintaining ES cell pluripotency [1, 20, 21]. The qRT-PCR data also suggest that zygotic transcription in Atlantic cod embryos is initiated between days 2 and 6 post fertilization. 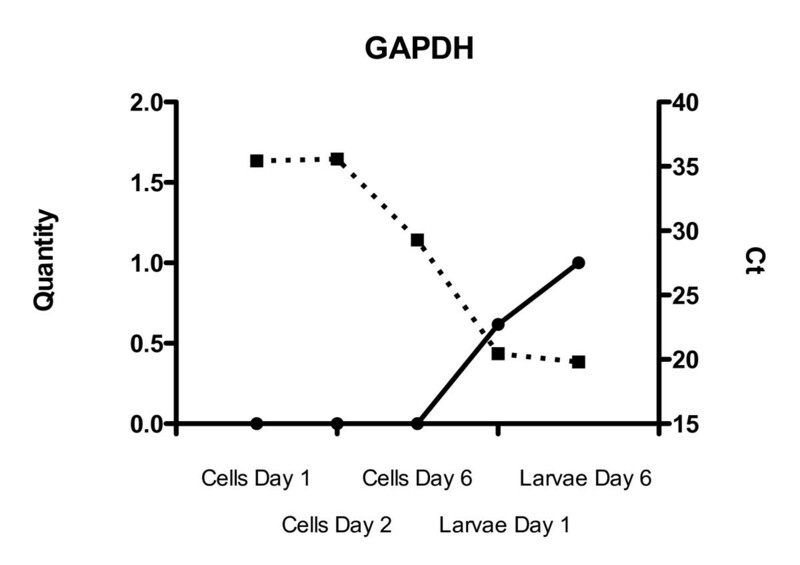 Almost no GAPDH transcription occurred in the cells at day 1 and 2 (Ct values around 35) (Fig. 3), whereas the transcription was more than 60-fold higher at day 6 (Ct around 29), suggesting increasing carbohydrate metabolism and glycolytic activity in the cells at the gastrula stage. For GAPDH, only raw Ct values and un-normalized quantities are presented (Fig. 3). Raw CT values were transformed to quantities using the comparative delta CT method where the highest relative quantity for each gene is set to 1 as required for input into geNorm. Transcriptional levels of BMI1 polycomb ring finger oncogene (BMI1), One-eyed pinhead protein (OEP), Pre-mRNA processing factor 19 (Prp19) and Ovary-expressed homeobox protein in Atlantic cod embryos at 1, 2 and 6 dpf (n = 3), as well as in larvae at day 1 and 6 (n = 1). At the blastula and gastrula stages, cells from about 100 eggs were used; yielding approximately 100,000 cells in cells at day 2 and many more cells at day 6. 10 larvae were pooled together for each of the larvae day 1 and day 6 samples. Mean normalized expression (MNE) – whole line. Raw Ct – dotted line. GAPDH quantities and raw Ct values in Atlantic cod embryos at 1, 2 and 6 dpf, as well as in larvae at day 1 and 6. Quantities – whole line. Raw Ct – dotted line. The authors like to thank Anders Lanzen, BCCS, University of Bergen, for help with large-scale annotation of sequences. Kai K. Lie, Natalie Larsen and Hui-Shan Tung are thanked for technical and analytical help and David Boyle (all NIFES) is thanked for proofreading the manuscript. We also like to thank Marine Harvest Cod, Øygarden, for providing the eggs and larvae. This project was financed by the Norwegian Research Council 165233/S40 and 173534/I30 grants. EH was responsible for cell sampling and all ES cell work and critically revised the manuscript. PAO analyzed the ES cell cDNA library and the qRT-PCR data and wrote the manuscript. Both authors read and approved the final manuscript.